Videogame consoles have been about more than just videogames for a while now, from Nintendo's news-downloading Famicom modem to the music-playing Sega CD. But the game console didn't really become a multimedia hub until the PlayStation 2 and its included DVD player. Thanks to a combination of strong brand recognition, a low, Sony-subsidized price point and impeccable timing, the PlayStation 2 became the movie player of choice for millions of consumers ready to advance past the decades-old VHS format. For a time, PS2 hardware was selling better than PS2 software in Japan, suggesting that many early buyers were ignoring the system's game-playing functions altogether. More than any other product, the PS2 drove DVD adoption in the format's infancy, driving down prices on hardware and software through sheer volume and force of corporate will. Now, one console generation later, videogame makers are again trying to use their position in the gaming space to influence the home movie market. So far, the results of their efforts have been less than transformative. Of course, things are a bit different this time around. Instead of a single DVD standard, we now have two high-definition movie formats fighting for dominance: Blu-ray, which is integrated into Sony's PlayStation 3; and HD DVD, available as a $179 add-on player for Microsoft's Xbox 360. Roughly one year out, the larger movie format battle is at a bit of an impasse - while the lower-cost HD DVD players are selling more on the hardware side, the Blu-ray camp is selling nearly twice as many actual discs, mainly due to a larger selection of movies. 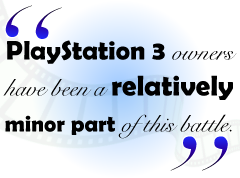 In general, PlayStation 3 owners have been a relatively minor part of this battle. "We estimate that [PS3 owners] are buying movies at a rate of the low single digits per year, as opposed to the 10 to 12 movies a year the owners of dedicated players consume," says Tom Adams, President of Adams Media Research. While consumers might see Blu-ray movies as a nice bonus feature on the PS3, the system is selling (or not) on the strength of the games. "I think within six months after someone buys a PS3, they're primarily gonna be using it to play games," says Greg Kaufhold, Principal Analyst at In-Stat. "The Blu-ray movie playback feature is not going to be that important, because why they bought the PlayStation 3 in the first place was to play games on it." That doesn't mean Sony's system is having no impact on the race. Adams said the sheer number of PS3s sold has helped the Blu-ray format, even if console owners aren't buying many movies. "It's definitely having an impact early on. What it's not doing is having the major impact studios hoped, which is that the game homes would see the purchase of one of these machines as a great way of purchasing lots and lots of HD movies."